Anna Pearson can supply a wide range of hand painted canvasses for cushions, rugs etc. A hand-painted canvas is unique and prepared especially for you. There are many factors that you need to consider or talk through with Anna before placing an order. This will ensure the most enjoyable stitching and best possible results. 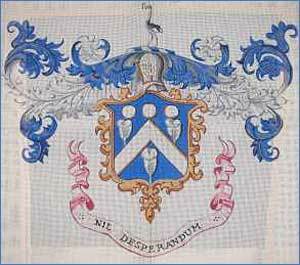 Anna has an extensive reference library of specimen flowers, groups or baskets of flowers, family crests, zodiac signs, etc as well as historical sources if you a require a period look. Shades can be changed at no extra charge. In the majority of cases other than rugs the canvas is 18 mesh. Designs can be quoted for other mesh sizes of canvas. See the Painted canvasses and Rugs Price List. On all designs except for the rugs Anna will quote for just the painted canvas. This allows you to select your own threads or you may wish to use threads you already have. Background threads can also be supplied, please contact Anna with the dimensions of your piece and the stitch you intend to use. Some people like to work an area before finally deciding on a background colour. For rugs the price includes the background wool. You should tell us the shade and stitch you wish to use. 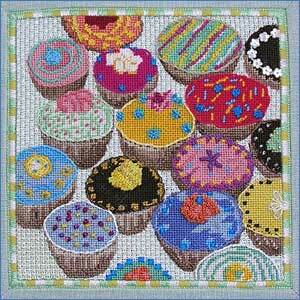 These are great fun to stitch and guaranteed not to be fattening! Stitch and thread suggestions are made. On individual cakes you can go wild with silk, metallics and braids - raid your bits bag and enjoy. 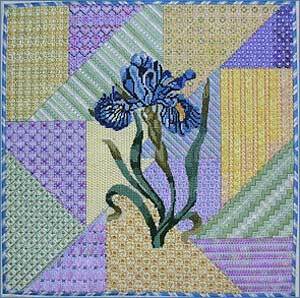 Beautifully detailed Iris set off with a patchwork background. Each area is painted in a pastel shade for lacy stitches to be worked on top allowing the painted colour to show through and become part of the scheme. Full range of suitable stitches is diagrammed and thread suggestions made. Thread pack available as an an optional extra. 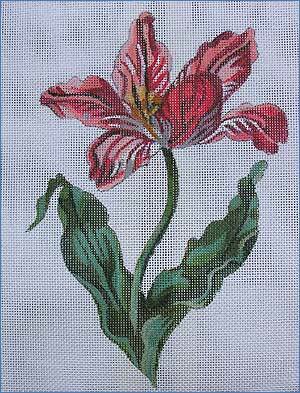 Flowers are and will always be one of the most popular subjects for needlepoint. We have a small range, Auricular, Botanical Tulip (shown here), Lily and Iris as well as Amaryllis, Poppies and Passion Flowers all on the Price List. However Anna is delighted to quote for other flowers or bunches of mixed blooms for chairs, fire screens or wall hangings. Frames or cartouches around a group of flowers can both look good and enable the background inside and outside the frame to be worked in different stitches or even a darker shade - more interesting to work for a larger piece. Contact Anna with your ideas. These Signs, Sagittarius (Anna's sign) and Cancer (her husband Robert's sign) are inspired by historical sources from earliest times. 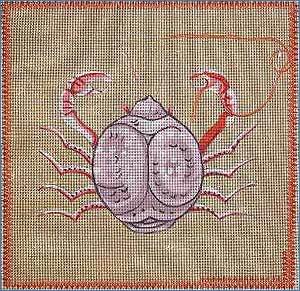 They both have dull gold painted background with a lacy stitch achieving an antique look. Your own Sign can be prepared or you may have a favourite version that you would like to be quoted for. For rugs the price includes the background wool. You should tell us the shade and stitch you wish to use. Although the first two designs below are illustrated with black backgrounds to imitate the marble of the inlaid precious gem tables that inspired them, when ordered the background is not painted thus allowing a colour that suits the stitcher's decor. While the price includes the background wool, some people like to work an area before finally deciding on a background colour. Again different sizes, mesh or colours can be quoted for. 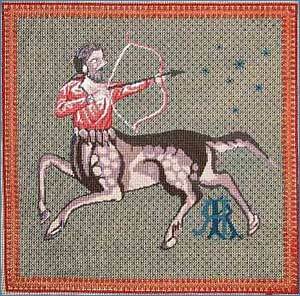 Contact Anna at anna.pearson365@gmail.com, or phone or email your Needlepoint Networker. See the Contact page for details. 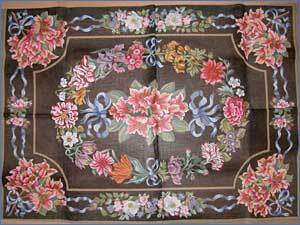 This is suitable for use as a either a rug or a wall hanging. The backgound can be chosen to suit your own decor. 94 x 137 cm 14 mesh canvas. We can work with you on any ideas you may have, your favourite flowers, an adaptation of a wallpaper or fabric motif. With these, a life-size line drawing can be prepared for your acceptance before the final work is started. A small charge, to be deducted from the final cost, is made for this. The use of a frame is always recommended. Frame size depends on the size of the piece. 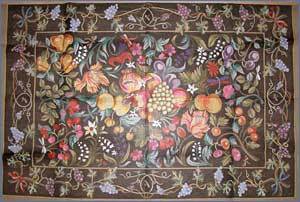 For a rug you can use an 18 inch square frame, which you move around as the work progresses. Alternatively, and highly recommended, you can use a specially ordered pair of long stretcher bars, the width of the canvas, plus a pair of 16 or 18 inch bars to make a rectangle.